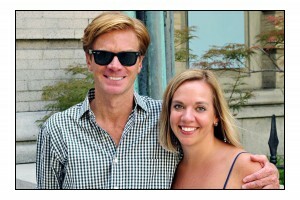 My sweetie and I took a road trip to the Holy City last week to celebrate our fourth anniversary. We were trying to decide between Charleston and Savannah, knowing that either one had the potential for being hot as hades, but something about Charleston had a little more appeal to it. We’re happy with our choice. The heat wave broke, and though it was in the 90’s, it was bearable. When researching a place to stay, I had a few “must haves”: location, king-size beds, and charm. There were other things like the breakfast that would be included and whether or not it provided an afternoon cocktail hour that I considered as well. And then there is price – which ranges from $100 – $400 / night. I looked at no less than 20 different B&B’s and boutique hotels, their websites and their customer reviews, before settling on Ansonborough Inn. We couldn’t stop repeating throughout the trip how lucky our choice had been. Located just two blocks north of Market Street on E. Bay, it was a perfect location to put us within walking distance of everything we wanted to do. An old paper warehouse from ~1900, the Inn emotes charm through exposed brick walls and heart of pine beams while bejeweling itself with literally hundreds of hand painted oils in heavy gilded frames. 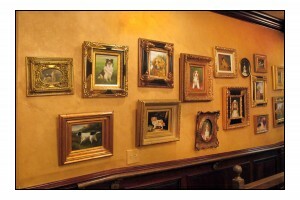 (A wall in the hospitality room displayed a grouping of various dog painting – beautiful!) The rooms were remodeled about 10 years ago, and so the place feels fresh and clean. Ansonborough Inn does offer a 5-6 p.m. wine and cheese reception, and while its breakfast had one bad review that I saw, we thought the quality and quantity of offerings was perfect for us given the other meals we expected to have at lunch and dinner: hot & cold cereals, breads & pastries, fresh fruit, yogurt and boiled eggs with juice, coffee and tea. All of the staff we met were warm and helpful. The Inn also has a lounge area on their roof that offers nice views of the city. We went up there one night just to check it out, but quite frankly it was too hot during the day and we were too tired at night to take advantage of this perk. But we had all of this and our three night stay averaged out to ~$170 per night (including taxes). If you’re planning a trip, we highly recommend Ansonborough Inn. With a weekend trip to Charleston, you’re probably waiting for me to talk about food, and we had some wonderful deliciousness but it also deserves its own post, so stay tuned for that. What did we do? First, one of the goals of this trip was to chill. I have a tendency to want to do, do, do when it comes to trips like this – so much that in the end, I feel as if I need another vacation to recoup from this one. I didn’t want to make that mistake here, so I did very little research before the trip and had only book two excursions – a carriage ride and a ghost tour. The carriage ride was booked with Palmetto Carriage, and I did it the same time I booked our room. I felt like the carriage ride would be good early in the trip to give us a “lay of the land” since it had been a while since either of us had been to Charleston. We did it Friday morning, and it served it’s purpose. It was about a a 1 hour ride in a buggy – four rows of seats facing forward rather than two facing each other (just incase by “carriage” you’re expecting what we were – a ride in a carriage). 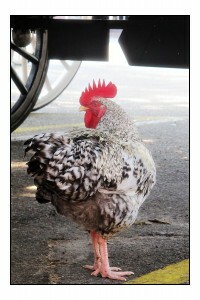 An interesting thing about the carriage rides. The tourism industry in Charleston is very regulated. The carriage had to “check in” with the city on its way out. We were taken through “zone 3” which was more residential and part of the college, less of the historical district. I don’t know if there is a way to request which zone you’re headed for, but had I known, this probably wouldn’t have have been my choice. 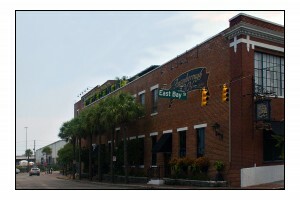 We also pre-purchased tickets for a ghost tour through The Ghosts of Charleston Tour. I picked this one because it had been featured on some of the TV shows that my husband has become addicted to. Perhaps it is because of these shows, we were very disappointed that we didn’t see a ghost. The best part of the tour was going in the Unitarian grave yard, what some spirit seekers say is the most “active” part of Charleston. Our guide was just so-so. We asked him if he had ever seen a ghost, and he went into a story about his mother-in-law in the hospital. I think if I were giving ghost tours in Charleston, I could come up with a something better than that. I mean, don’t let the truth get in the way of a good story, right? The other “touristy” thing we did – that we really enjoyed – was the boat tour of the harbor. First, because it was so hot while we were there, it was nice to be sitting with a breeze. We learned a lot about the history of Charleston and the area around it, which includes Forts Sumter, Johnson and Moultrie; Sullivan’s Island, and Mount Pleasant. Other than this, I printed out the walking tour of Museum Mile along Meeting Street, so we did our own sort of tour of notable houses and churches that way. By far the very best part of the trip was the unexpected – and I’m sorry to say ‘not for sale’ – tour we received from my dear college friend who is now a Charleston resident and licensed tour guide. When we touched base our first day there, K. Cooper Ray (creator and author of Social Primer) picked us up and took us on the best tour of historic Charleston complete with celebrity homes and gossip to boot. We will definitely be going back to Charleston, and soon I hope. For us it was just a little over four hours to drive – and literally all but 5 miles is on interstate, so easy. I’d like to go back and do nothing but browse art galleries looking for a special piece to bring home. I’d also like to go back and do nothing but tour churches. They have some beautiful ones there – it is the Holy City after all. What about you? Have you been to Charleston? If so, what was your favorite part, and what are you looking forward to going back to see? I spent half a day in Charleston and all I did was take some gorgeous photos ()of gardens, gates, fountains, cool buildings and had lunch at the Southend Brewery and Smokehouse on E Bay St.
We decided to go to Savannah, Tybee Island and Amelia Island for our Sept vacation this year. LMSS – I did some of that, too! 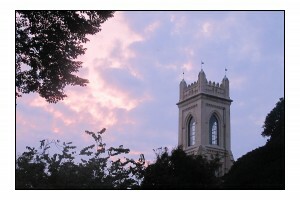 (Photos…) I hope you’ll post about your Savannah trip! Charleston holds a special place in my heart! I lived there for a few years in my 20’s and still miss it often. That zone thing with the carriage rides is a little crazy. It is totally luck of the draw so it is great you had some other tour opportunities. So funny we were there so close in time! My favorite thing to do in Charleston is EAT…such good restaurants and some nice food specialty stores. Hominy Grill is a perennial favorite and our trip to Husk last week was a religious experience for someone who worships food! lol We have already talked about going back, too…as you note, it is a (relatively) short drive. @Bunny – I know! Too funny. The post about food is coming up tomorrow… we had some amazing food, too! Must take a trip there!